Anna J. Weaver is an Amish artist living in New York state. If “artist” doesn’t strike you as a typical Amish occupation, that’s because it’s not–at least not in the classic sense of someone who creates painting, sculpture and the like. The simple daily chores and pleasures of Amish life are what Weaver knows best and what she uses as the subjects for her acrylic paintings. Just as engaging as her art is her story, from wife and mother of six to an exhibiting artist in the Holstein Gallery at the Erie Art Museum. Weaver is originally from Spartansburg in Crawford County and now lives in nearby Sherman, N.Y. She’s had no formal art training — in fact, she has only the eighth-grade education typical within the Amish community. Encouraged by her mother, she’s a self-taught artist who began by painting on roof slates and smooth stones gathered from the fields. Weaver’s later paintings were on exhibit in a Sherman used book store when she was commissioned to paint a large-scale mural on a local restaurant wall. That effort brought her to the attention of the Something Unique Gallery in Sherman, where her works — now painted on canvas, canvas board and even circular saw blades — have been exhibited and sold since 2009. One Amish knock against art as an occupation is that it often spotlights the individual–potentially unhealthy in a culture built around community. Though creating artwork is a relatively rare Amish profession, Weaver is one of a number of Amish artists both past and present, including Susie Riehl and Barbara Ebersol. D. L. Miller of Munfordville, Ky. I have an Amish painting that I got in kind of a weird way. I live in a Senior Apartment Building and one of our residents passed away. The family said to just get rid of the items in the apartment. By the time I heard about and got there, almost all of it was gone, but this painting of an Amish girl. I asked if I could have it and was told take it. I really like that painting. I moved from one apartment to another and am looking for it. I want to tell you who painted it as I would like more information on him or her. I put it some place to protect and know where it is and now I can’t remember where I put it. Amish Artists are rare, mostly because it is considered a waste of time. Although they use their art in making homemade greeting cards and little things like that, but not to display to the public. It is considered a form of pride and the church has it’s concerns of where it will take that specific person. Ralph, Rose Schmucker of Middlebury, Indiana is an Amish painter who does commission work (or at least did, as of publication of a story on her in the Connection a few years ago). You can find her story, contact and samples at this link, look at the last sample page image. Christy Otto who Linda mentions below I believe is in Topeka, IN. I have been painting and teaching art for 25 years most of my painting of with Amish have sold but I do have a lot of images . Marlene what kind of subjects do you paint, mostly Amish images or others as well? Katie, thanks for bringing this up. I think many see a difference in making an item whose primary purpose is aesthetic appeal vs. an item which is first functional and secondly has an artistic aspect others can appreciate. That said maybe this is eroding somewhat especially in more progressive communities. I think the attitude and social position of the creator may also have an influence in how it is perceived. I also find it interesting that there are many examples of artwork appearing in stalwart Amish publications like Family Life, every issue of which features a piece of art on the cover and reader-submitted art throughout. I always considered quilt making a form of artistry. Obviously many patterns have been passed down and copied. Also, I do have an Amish friend who makes beautiful greeting cards which she uses herself and also sells. I don’t know any artist who paint here in Lancaster, PA. I have an Amish friend, who, along with her mother paint beautiful scenes on slate (if it can be found) and also on wood. The daughter is also very gifted in painting murals. As stated in the article, they paint mostly farm scenes and things that are related to their every day lives. I have had the daughter make wooden plaques for baby showers, weddings and the like. They are from Lancaster County. I have a beautiful painting by the late Emma Schrock. She was a disabled Mennonite woman from Elkhart, Indiana, who did painting as a pastime and sold it for a living. The son of an Old Order Mennonite friend living Near Leola, Pa. was born without useable arms. David Nolt paints by mouth and got his start by doing pencil drawings for cards. When they sold, he progressed to the point where most of what he paints now, I believe, is sold before it is painted. It seems to me he said he sells to a buyer from Switzerland. David’s grandfather, Harvey Martin was also an artist, but he worked with wood, creating chairs, furniture, grandfather clocks, and even a stage for some very well known singer. All his furniture, when sold to other than Mennonites, had to have his signature. Osiah, I have been to the Holt home and have seen first hand the art you are speaking of. He is tremendously talented and to know that he paints with the brush held in his teeth makes it all the more so. I was there for a meeting with some other ladies and his mother showed us some finished paintings and some still in progress. Wow, hadn’t heard about him. That is impressive. Thanks Osiah and Colleen. I love the painting you’ve shown here – such an interesting perspective and wonderful colors! Would an Amish person be able to be it on the wall? Does painting as an occupation have to be okayed by a local bishop? 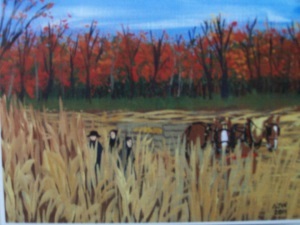 Where would one buy an Amish painting? Adair displaying “artwork with nothing attached” is not too common though in more progressive groups might be more likely to see it. I’m not sure how formal an “okaying” it would be as much as someone might start doing something and it is either implicitly accepted or it becomes an issue which is addressed. Just generally speaking about other things that Amish might do beyond “the norm”, issues may arise if someone show pride or a poor attitude, is acting outside what is explicitly described within the Ordnung or if others in the church find issue with whatever they are doing. If someone is marginal or in exceptional circumstances (for instance a disabled person) generally more leeway is allowed both in things like this, technology allowed, etc. As far as buying, looks like you could do that either direct from the creator or at outlets such as the one I linked in the caption of Anna Weaver’s image above. In the ERIE TIMES-NEWS link you mentioned, it says that “The Amish Art of Anna J. Weaver” display continues through June 14, with free admission, in Erie, PA.
Christy Otto drew the pictures for the TRUCK PATCH COLORING BOOK. 3-D artist twins Abner and Aaron Zook were born Amish in 1921 in PA, but changed to cars. Though they have passed on, there is still interest in their pictures. An Amish woman, Anna Lapp, painted the mural in Pinecraft Park, Sarasota, Florida. I remembered seeing (in this blog, I believe) the mural in Pinecraft Park in FL. I showed it to a friend who asked many of the same questions as posted here. I was thinking about art as being practical…how Amish display calendars, for example, which have pictures of some sort (photos, drawings) that they’ve chosen for “looks”, not just the calendar. I’m sure there are other ways around it (maybe write a bible verse around the edges of a painting?). Does it count if an Amish lady paints on china teacups? I knew an Amish lady in the 1970s in northern Indiana who made wall-hung mottoes featuring Scripture verses, moral sayings, and family records. She used the technique of reverse painting on glass backed with tinfoil. Some had flowers painted on them, and they were hung on the walls in Amish homes. Daniel Esh of PA, an Amish artist, founded the Amish Country Farmers Market in Easton, MD. always a page called “Ponderings and Musings” which contains several pencil drawings done by Amish/Mennonite children. Some are very good. They usually give the child’s name, hometown and age. I’ve often wondered if these children will keep on with their artwork as they become adults. Maybe this is another sign that Amish are becoming more accepting of artwork being done by Amish people. Would anyone know of any Amish artists in Pennsylvania? I have two Amish friends in Lancaster. They paint using various mediums. The subjects are usually farm scenes and other things that are part of their daily lives. If you are interested in their work I could ask them if they are interested in exchanging contact information. Colleen my family is going to be visiting Lancaster Pennsylvania in June and I would love any information you have. If they sell their things local I would love to also know. I wasn’t sure if any of the surrounding towns might carry their art. Thank you for your comment. Al’s comment reminded me that the Family Life publication always has drawings on the front cover & many drawing throughout. There is normally no name, so perhaps the Publisher has an artist? I enjoy this publication & pass them on to Amish friends. Their address is Pathway Publishers, 10380 Carter Road, Aylmer, ON, ON N5H 2 R3, Canada in case there is interest. Don’t really know what to say about this! I’m not one for pictures (I try to avoid the temptation, at least), and I thought that, for the MOST part, the Old Order Amish weren’t either. Well, that is what pride + ignorance + isolation leads to (I’m talking about me. Haha). I would wonder if this artist lived in a more liberal community, compared to other Amish communities. In an issue of The Budget newspaper last fall (2017), in a letter with news from Topeka, Indiana, it mentioned a gathering of Amish/Mennonite artists that was held at an Amish home in rural Topeka. It was considered well-attended. When I visit that area this spring, I’m going to try to learn more about Amish artists in that area and what type of artwork they do. I am a graduate student doing research on art as therapy with the Amish. I live in North East Ohio and am looking to interview an amish artist. Would anyone help put me in touch with an amish artist who might be willing to sit for a short, anonymous interview??? Thank you! !